“We’re pleased the court saw through the Trump administration’s attempted sleight of hand here. The Trump administration tried to use a two-page memo from the attorney general as window dressing to cover a patently unconstitutional executive order. It didn’t work. The law doesn’t allow the administration to do what it’s trying to do, and no memo from Jeff Sessions is going to change that. As the court noted in its ruling, the memo is an ‘illusory promise.’ The attorney general could revoke it at any time, or the president could replace the attorney general to revoke it. The memo leaves the administration perfectly free to continue to threaten sanctuary cities, and the executive order remains fundamentally flawed. Now is the time for the president to rescind it. We’re pleased we have forced this administration to back down for now and offer a narrower description of the funding at stake under this executive order. Our work has so far protected billions of dollars that provide seniors and low-income families across this country with food, housing and healthcare. The Trump administration tried to use a two-page memo from the attorney general as window dressing to cover a patently unconstitutional executive order. It didn’t work. While the president plays to people’s fears by demonizing immigrants, the evidence is clear: not only are immigrants less likely to commit crimes, UC San Diego research shows that sanctuary jurisdictions are safer. That’s because victims and witnesses are willing to come forward and report crimes to police. That cooperation gets criminals off the streets and makes everyone safer. The president and attorney general like to spread the falsehood that sanctuary jurisdictions harbor criminals. Not true. The federal government knows everyone in San Francisco’s jails. We send them their fingerprints. If the federal government thinks someone is dangerous, all they need to do is get a criminal warrant or a court order. 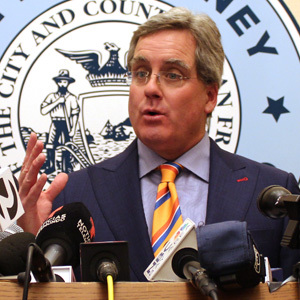 The City and County of San Francisco was the first entity in the country to challenge President Trump’s unconstitutional Executive Order on sanctuary cities in court. Santa Clara County and the City of Richmond later filed similar lawsuits, which are now related in U.S. District Court. One of President Trump’s motions at issue in today’s ruling had sought to dismiss the lawsuit Herrera brought on Jan. 31, 2017 challenging the constitutionality of the President’s Executive Order. The administration also sought to have the court reconsider its April 25, 2017 preliminary injunction ruling that put in place a nationwide halt to enforcement of the executive order while the case is decided in court.